The area’s newest golf course, Applecross Country Club, is private, part of the Talamore Group, which includes Talamore CC in Ambler and the 36-hole Talamore Resort in Pinehurst, N.C. That means access is limited to members, their guests and anyone who makes it there for a tournament, outing for function. Designed by Nicklaus Design – primarily by Jack Nicklaus’ youngest son, Michael – Applecross was eight years in the making. When work began in 2002, Dallas-based Club Corp was developing the course and a host of country club amenities as the centerpiece of an upscale Pulte Homes residential community. Early on, the project stalled for about four years, thanks largely to environmental permitting issues. During that lull, Club Corp decided it wanted out and went looking for a buyer. It found one in the Talamore Group, which took over in the winter of 2009 and saw it through to completion. The grand opening was last July. When it first opened, I found much to like about Applecross. For starters, as a member, what’s not to like about having access to a second course in the area for which you par nary a nickel more? Equally important, Applecross is a nice complement to Talamore, a very different golf course. While both courses wend their ways through residential developments, Applecross is far more sprawling and wide open, plus the terrain is much hiller. There were, however, two or three holes left me scratching my head. A year after the grand opening, Applecross has grown in, and it has grown on me. Now that I’ve played it eight or 10 times, I’ve come to know many of its nuances. Also, as with any new golf course, the staff has used that first year to identify issues and make changes and refinements, which has resolved almost all of my early quibbles. More on those changes later. At 7,028 yards from the back tees, Applecross is not overly long by today’s standards, nor is it overly difficult for most all levels of golfers. 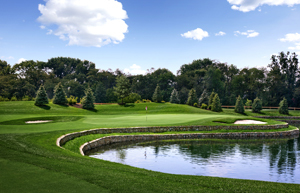 That’s because both Nicklaus and Bob Levy, owner the Talamore Group and a man who had a big hand in the design at Talamore, are keenly attuned to complaints from many recreational golfers that too many of today’s modern courses are too hard. Who needs to be punished and humbled by a round of golf? Hence, from the back tees, Applecross plays to a respectable 74 rating, 131 slope; from the forward tees, the numbers are a very manageable 65.9/112. Online yardage book. Scorecard. To show off the course, Applecross held a media one day last month, inviting Michael Nicklaus back for his first return visit since it opened. Applecross was his third project as the lead architect, and he was pleased with what he saw. "For a year-old golf course, it’s in great shape," said Nicklaus, who attended Georgia Tech on a golf scholarship, then played the mini-tour circuit for a time. "The members are enjoying it, which makes me happy." The same environmental issues that caused permitting delays also gave Nicklaus more than a few design challenges, which have consequences. "The finished is a different from what we expected," said Nicklaus. "There are a lot of places we weren’t allowed to go." That is not a complaint, merely an acknowledgement of the reality that working architects face today. Every project comes with design challenges and restrictions, big and small. Applecross starts you off nice and easy with short dogleg par 4 that is the soft underbelly of the front nine. There’s a fairway bunker in the elbow of the dogleg and a greenside bunker, but neither really come into play. Even with a so-so tee shot, you’re left with a wide open approach shot with a short iron for any easy par. From there, the outward nine picks up pace. No. 2 isn’t long (375 yards), but it is a narrow, winding uphill dogleg, with OB on the left and the right, plus fairway and greenside bunkers. For some reason, every I finally make it to the green, I feel like I’ve climbed a mountain. Perhaps that explains why I have yet to par this hole. No. 3 is the longest of the four par 3s at Applecross; it’s a devilish downhiller, with a wide green and framed by a backdrop of trees. Again, there’s OB left and houses to the right. Because of the accuracy required off the tee, it’s a bit of a white-knuckler, especially if you’ve got a hybrid or even 3-wood in your hands. The front side boasts two delightful short par 4s, and No. 4 is the first of them. It’s a dogleg left, only 320 yards from the tips, up over a blind, crested fairway that banks from right to left. The play off the tee is to hit a 3-wood and let it kick left off that hill, leaving a wedge into the green. At least I thought that was the play until my last round there, when I saw a young guy bomb a driver over the hill, almost to the green. The beast of the front nine is the long par 4 5th, not surprisingly the No. 1 handicap hole at Applecross. Even from the middle tees (417 yards), the tee shot is the most daunting of the round, needing to carry a wide no-man’s land hazard that slashes diagonally across the fairway. The more aggressive you want to get in cutting the corner, the more the required carry. If you’re a wimp and play it safely to the most reachable landing area, you turn a long, difficult second shot into an even longer, more difficult second shot. Unless your tee ball is up the right side of the fairway, the green, which is protected by a large bunker, is obscured by a hill on the left that has never met a second shot that it didn’t want to knock down. The next time I reach this green in regulation will be the first time. Most rounds, I just accept my bogey and limp off the green, head down. Once you put the 6th, a forgettable uphill par 3 in your rearview mirror, the front nine finishes with a flourish. There’s the 7th, a 374-yard uphill dogleg, which yardage book describes as "target golf at its best." The play is to lay up short of a vast expanse of six bunkers that fan out in every direction and dot the uphill fairway, to a green dug into the side of a hill. Fun hole, easy par. If No. 5 was the most daunting tee shot so far, No.8 and No. 9 are where you can come out of your shoes swinging for the fences. The 8th is a mid-length dogleg par 4 with a downhill tee shot and fairway that feels as wide as a football field. The term "signature" holes is out of vogue these days, but if Applecross has one, it is definitely the par 5 9th..
From the elevated tee, which overlooks the Applecross clubhouse and pool, the tee shot is even more downhill than the 8th, into a most generous fairway. There are four fairway bunkers in the distance but they are unreachable by the likes of me. What makes the 9th, however, are the second and third shots. Beyond the raised fairway bunkers, far in the distance, lies the green, which is obscured by the bunkers and tucked behind a pond on the right side. Unless you are Bubba Watson, it’s a three-shot par 5, with the second shot needing to give wide berth to that pond on the right. After that, it’s no more than a wedge or a pitch and run, making this a potential birdie hole. From the day it opened, the 10th was the ugly red-headed stepchild of Applecross. They are trying to change that. In the original design, it was to be a short dogleg right, 350 yards, with death on the right and a fairway that ran out, into knee-high grass. From there, it was to be a short iron into a slightly elevated, smallish green tucked behind two bunkers. But environmental restrictions nixed the intended box, forcing Nicklaus to move the tee 50 yards forward. From there, the new play was a hybrid or 3-wood, and even then some tee shots ran through the fairway and into the deep grass. Nobody was happy with the hole. The solution has been to cut the knee-high grass and extend the fairway all the way to the green. Now, you can still lay back and have a short iron in, or you can try to bomb it around the corner to set up a potential birdie. They took lemons and made lemonade. The most visually arresting tee shot at Applecross comes is the 590-yard dogleg 12th, the longest hole on the course and one of three par 5s on the back nine. The tee shot is across an deep, imposing crevasse, into an elevated fairway that angles sharply left and is as wide as an eight-land freeway. The green is in the far distance, down a hill, then up again. It’s a big, big hole, and together with the adjacent 13th, a dramatic downhill dogleg, the 12th and 13th combine to offer the most spectacular scenery at Applecross. If there is a hole at Applecross that is determined to put you in your place, it is the 14th, a long, narrow, brutal par 3. I say that only half in jest because I have carded at least 3 pars at the 14th. But I have also done my part to ensure that there will be no layoffs at the Titleist factory any time soon. It is long (227 from the tips, 194 from the white tees) and all carry. From the back tees, forgettaboutit. From the white tees, I have nailed hybrids as good as I can nail them, then stood there posing, only to watch the ball ker-thud into the nasty stuff short of the green. Again, environmental restrictions were the issue at the 14th, precluding Nicklaus from building a forward that would have made the tee shot more manageable for most golfers. The 14th has been softened somewhat by moving the blue and white tees down as far as possible, in the 160-yard range, and by creating more bailout area around the green. The second hole on the back nine that separates the studs from the hacks is the mid-length par 4 16th, , where the second shot requires a 160-yard carry over junk, into an elevated green with a false front. That’s 160 yards assuming your tee shot has come to rest just short of the hazard, which, for some of us, would require playing the hole from the forward tees. Otherwise, that second shot is more like 180 or 190 yards – all carry -- into a green with a false front. Good luck with that. This too shall soon be remedied by a new tee that enables most ordinary golfers to lay up just short of the junk. The closing hole is a narrow par 5 that makes for a fast, furious finish. During the rounds I Ôve played there, somebody in the group almost always birdies the 18th, affecting the outcome of the match. That’s a nice way to finish. What’s the bottom line on Applecross? I’ll still play Talamore more often, if for no other reason than I can roll out of bed and be on the first tee in 10 minutes. But I also feel the tug of Applecross, and I’ll make a point of getting out to Downingtown another half-dozen times before the season is over. Put another way, if Applecross was a daily fee course, I’d work it into my rotation, along with Raven’s Claw, Lederach and the GC at Glen Mills. That’s saying something. For those looking to play AC in an outting...enjoy. It’s a very nice design with some very nice holes. Both AC and Talamore just love outtings. If you’re looking to perhaps join AC as a full tier golf member....save yourself the grief. Unles you enjoy being treated like a second-class citizen at your own clucb and enjoy having your questions\comments\concerns ignored time after time after time. The bottom line is the only concerns management has are 1) get as many bodies per year onto the course as possible 2.) get people to spend their money in the restaurant. They care nothing of the membership. Remember this not an equity club. They care about making money. And their money comes from outtings and booze. So it’s not hard to see where the loyalties lie. So if you want an afforadble CC to join...AC/Talamore could be your kind of place...just don’t expect to be treated like a member of a CC. But don’t take my word for it...show up on any Saturday or Sunday morning and talk to any of the regular members and ask them how they are treated. Or ask anyone you know who has already left. You’ll be glad you did. I played Applecross for the first time this past weekend. For a newer course, it was in pretty good condition. The course definitely has some memorable holes, but there are also a few holes that make you ask, "What were they thinking?" Here’s my two cents on some of the issues I had with the course. Hole #1 - Would be a much better hole if they didn’t cut down the rough inside the dogleg. Currently, you can just cut the dog leg and go straight at the green essentially without penalty. There are no trees or deep grass to contend with. Hole #3 - Not sure why you would design a downhill par 3 with a green that slopes away, especially when it is 233 yards from the back tees and there is junk over the back of the green. Hole #4 - Blind tee shot with a lot of trouble that cannot be seen from the tee. I’m not a big fan of blind shots to begin with, but having a blind tee shot on a hole that also requires accuracy is dumb. Hole #9 - Beautiful hole, but the placement of the mounds in the middle of the fairway that completely obscures the ability to see the green and water on the second shot is retarded. No doubt many unsuspecting golfers have hit into the water on their second shot because they were unaware of the water. Hole #10 - Similar complaint to hole #4. Blind tee shot with trouble left (which can be seen from the tee) and trouble right (which cannot be seen from the tee). Acer...yes, the 14th is not for mid level handicap players from the mid tees or back tees. You are correct. My understanding is that there was to be a lower tee box, but enviromental concerns from the township prevented building that tee box (which I believe was also the same issue with #10 & #4 as it relates to tee box placement & hole length?). The angle from the tee box you played is actually a much harder angle of approach. The 14th hole from those upper tees is, in my opinion, one of the best par 3’s in GAP. Forced carry, downhill, lateral left, bunker front right, slightly crowned green, tightly mowed collection & approach area. And the 2 holes before #14 are pretty great golf holes, as well. I’ve played Applecross twice so far. Gopher’s assessment is right on. I’d add the par3 14th hole as another hole that’s problematic. A 200 yard forced carry over wetlands is not for mid handicappers like me. I just move up to next forward tee at about 150 yards. For that matter, I play the next forward tees on most of the back nine, The front nine is ok from the second set of tees. Applecross is a great course, albeit with some growing to do and with a couple of holes that need some help. Continued construction has a negative impact on the views for some holes and holes #4 and #10 need more yardage & tweaking. The course still needs better definition & growth between fairway, rough and green complexes. The greens & tees are in excellent condition, with the greens being borderline flawless in condition- although they are small for a new golf course (especially a Nicklaus design). From the back tees, even the best players will be very challanged. If you can get a chance to play Applecross, I encourage you to do it. Hopefully, with a little more work & attention to detail, the place will be something really special. I played Applecross a couple of weeks ago and agree with most of your observations. The 9th is a fun par 5, so is the 12th.